So did you catch the story last week about a mystery missile in California? Yeah, there's video of the thing circulating around the web, and it seems to clearly show an unidentified flying object leaving a giant trail in the sky. NORAD, The Pentagon, the FAA, and the DOD all denied being involved in any kind of a missile launch, but none could explain what the object - seen by thousands of people - could have been. Each insisted there was nothing to worry about and that there was absolutely no threat, terrestrial or otherwise. Which to me is not all that comforting on the heels of just saying you have no idea what it was. In the end, it would seem that things are not always as they appear. Seems that, due to the curvature of the earth, a commercial airplane leaving a horizontal contrail behind it can create the illusion that it is climbing straight up. But why let facts get in the way of a good UFO sighting? So I was thinking it might be fun to see if there were timeshare rentals nearby famous UFO sightings that I could write about this week. But the green guys never turn up where lots of people (and cameras) are around to detect them, right? They don't fly right to the White House looking for our leader like they did in that movie Independence Day. Or do they? Turns out that a formation of orange lights was detected by D.C. air traffic controllers and thousands of people on the ground over the course of two nights in January 1952. The objects were verified by radar to be traveling over 900 m.p.h. Even President Truman was notified and kept abreast of the situation. Radio frequencies were scrambled in the Capitol and security threat levels were elevated. To date, no reasonable explanation has ever been offered and, officially, the flying objects remain "unknown". Man that's creepy! I mean, I am sure it was the Russians - or something we were building to use on the Russians - but what if aliens really did come in for a closer look at our capitol? Check out D.C. and decide for yourself by renting a timeshare at either Wyndham Vacation Resorts at National Harbor or Wyndham Old Town Alexandria. When you think of Los Angeles I am sure that a long list of movies about UFOs comes to mind: like ET, Close Encounters, Alien, and so forth. But have you ever heard of the Battle of Los Angeles? No, it wasn't one of those awful 1950s martian invasion flicks, but an actual event that occurred in 1942. Just a few months after the Japanese attacked Pearl Harbor, the west coast was on high alert for more attacks from the air. On the evening of February 24, a giant flying object was spotted by thousands of people on the ground and by U.S. military installations. 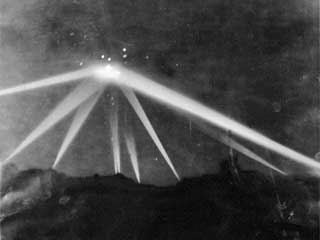 L.A. was put under blackout, and massive search lights locked in on the object. Soon the Army's 37th Coast Artillery Brigade opened fire on the object, striking it several times to no avail. In the end, it flew off and was last seen over Long Beach. They've even got a photo of the incident, available here. Are you kidding me?! I guess the nation was too consumed with having just entered World War II to even consider a war of the worlds. I think a trip to Southern California is in order, don't you? I suggest the numerous timeshares available in the Anaheim area as a base for your exploration. Then there's the case of the Lubbock Lights in 1951. Now you may know Lubbock, TX, as the birthplace of Buddy Holly - or at least you do now. But this event had nothing to do with rock 'n roll. Over the course of several evenings in late August hundreds of people - which is saying something in a town the size of Lubbock - witnessed 20 to 30 objects flying in a V formation in the night sky. Among the observers were three professors from Texas Technical College, and a student of theirs who managed to get several photographs of the objects. The photos were so amazing that they appeared in Life magazine. And keeping with a theme, they remain "unidentified" to this day. Now I won't lie to you. There isn't a timeshare resort within a hundred miles of Lubbock, TX. In fact, there isn't one within 200 miles. But if you are willing to consider neighboring New Mexico... do you see where I am gong with this? That's right, the grand-daddy of all UFO incidents occurred in Roswell, NM. You can rent a timeshare in Ruidoso, NM - about an hour outside of Roswell - and have yourself a UFO-themed timeshare vacation. Sure, your friends will think you're nuts, but you know better. Should you decide to embark on this quest, I would point out something that famed physicist Stephen Hawking recently had to say about alien encounters. They way he sees it, if extraterrestrials have already figured out how to travel here from the far reaches of outer space, they certainly possess the technology to liquidate us all in the blink of one of their giant black eyes. He makes a good argument for things not going so well for the home team in this scenario. But then again, would you rather be watching X-Files reruns when you get obliterated, or on vacation in the beautiful Southwest?